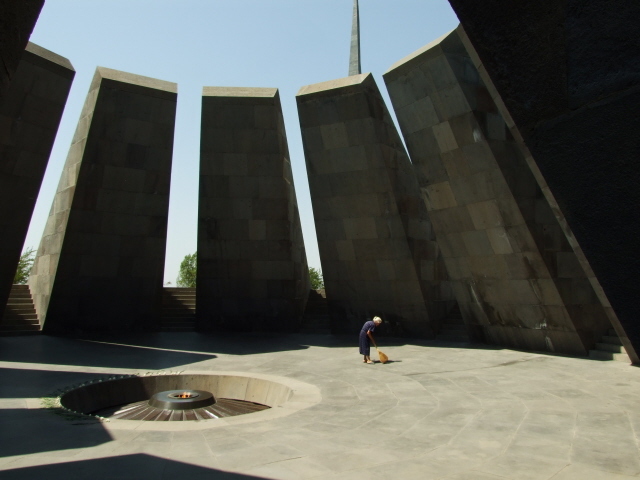 The main site commemorating the Armenian genocide of 1915 (and the build-up to it), consisting of a striking monument and a modern memorial museum and institute, located on Tsitsernakaberd hill in Armenia's capital Yerevan. More background info: See also under Armenia. 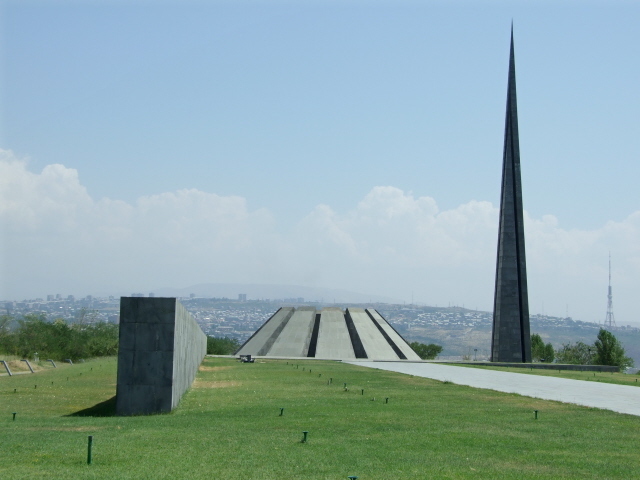 The monument was built in 1966/67 in response to mass protests in 1965, on the 50th anniversary of the worst phase of the genocide. 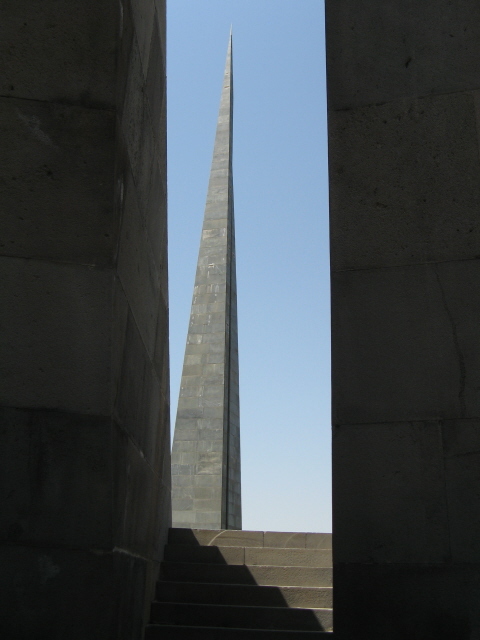 Of course, Armenia was then part of the Soviet Union, so it was quite unusual that such public demonstrations had such a positive effect – rather than crushing the protests (as happened so often elsewhere), they were acknowledged by the Soviet authorities and the Armenians were granted this monument. Still, it says a lot that it took 50 years for this to happen. 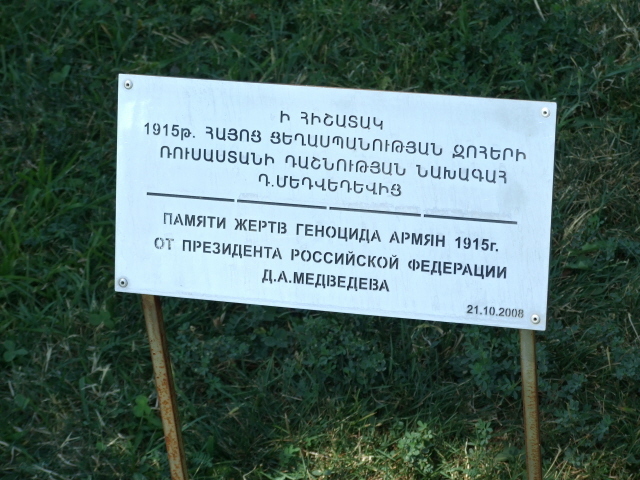 It then took even longer, until 1995 (the 80th anniversary of the genocide), for the adjacent museum to open its doors. Its design takes care not to distract from the main monuments, so it is built into the mountain side, i.e. is mostly underground, though the side facing away from the monuments opens out of the slope towards the Ararat valley – and Mt Ararat, Armenia's "holy mountain", now also in Western Armenia, i.e. on the territory of modern Turkey, is visible from here … at least on a clear enough day. In the summer haze it may barely be discernible. The exhibition inside the museum is not as reproachful in tone as you might expect, and rather remains solidly factual. This is quite a contrast to the exhibitions about the more recent Karabakh war, e.g. at Yerevan's Military Museum, or in the museums in Nagorno-Karabakh itself. Maybe the temporal distance makes this greater restraint possible. But of course there's also the issue that Turkey, that old foe in the west, still more or less denies that it was the perpetrator of this genocide against the Armenians. There has never been an official apology – rather on the contrary, some of the denial "arguments" blame the Armenians themselves. Within Turkey, it is still risky to acknowledge the Armenian genocide. It may be seen as in conflict with the Turkish penal code, which has a law against "insulting Turkishness", reformulated more recently as "insulting the Turkish Nation". Some prominent figures had to find out the hard way how dangerous it can be to get into conflict with this, such as Armenian-Turkish journalist Hrant Dink: he was sentenced to six months in prison and later murdered in broad daylight by a fanatic Turkish nationalist (who was never tracked down)! 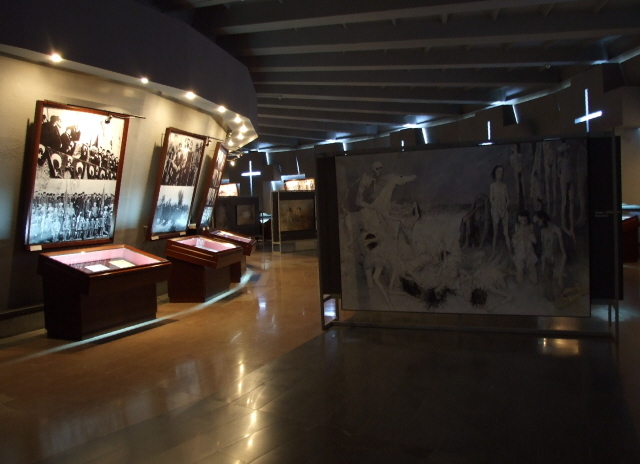 Given the power of Turkey in the region and as a crucial player at the crossroads between Europe and Asia, it was perhaps wiser to make the exhibition at Tsitsernakaberd not too demonising of the Turks. Still, even without open value judgements spelt out in the exhibition, the presentation of documents, photos and eyewitness reports (including by foreign diplomats) make it hard to doubt that the genocide did indeed take place. Of course most visitors will not need to be convinced of this, as coming here is already a kind of statement of acknowledgement, at least to a degree. 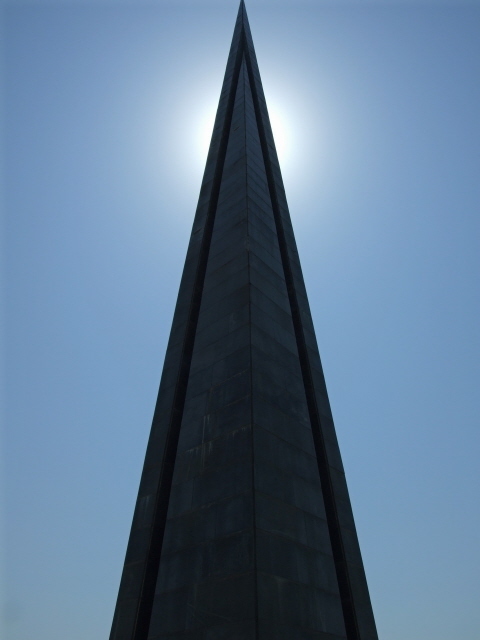 What there is to see: The monument is certainly an impressive design. 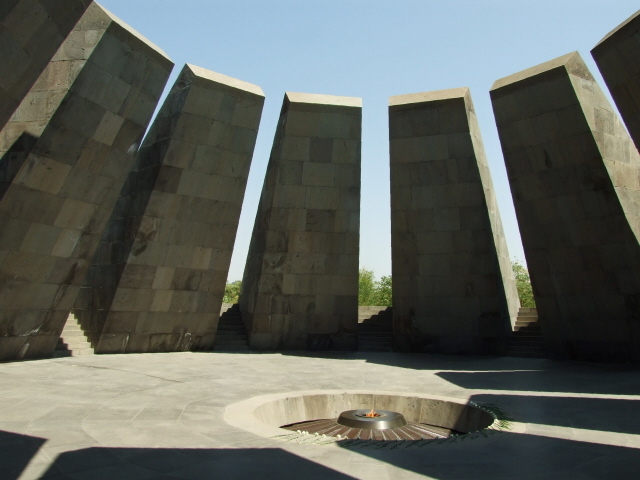 It mainly consists of a 44 metre high slim granite needle ("The Reborn Armenia" as it is called) and an eternal flame encircled by a set of 12 large grey basalt slabs – the number 12 represents the 12 "lost" provinces of the former Western Armenia, now in Turkey. The slabs are all leaning inwards towards the flame (supposedly symbolizing figures bowing down in mourning) at a rather sharp angle of ca. 45 degrees. The circular space within, with the eternal flame at the centre, is also set lower than the surrounding ground so one has to take steep steps down to enter the inner space and is thus forced to bow one's head too while doing so. 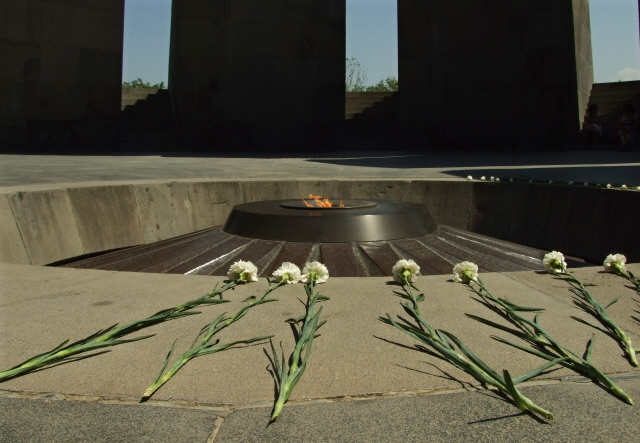 At normal times there are maybe just a few flowers laid down by the eternal flame – but at the dedicated commemoration day of 24 April, the place gets flooded with flowers as thousands and thousands of Armenian pilgrims congregate at this memorial. The design and the light-and-shadow effects of the huge grey slabs do indeed create a special kind of atmosphere which is difficult to describe. Especially when there aren't so many people about, it feels very sombre indeed. Just to make sure there's also sombre music piped through loudspeakers around the memorial complex – though I think it would probably work just as well without such an acoustic booster. Leading away from the central memorial there's also a memorial wall, with names inscribed on it of places where the genocide took place. The museum is built into the mountain, so it does not interfere with the effect of the imposing monument ensemble outside. There are steps leading down from the monument part, or direct access from the car park, which is also set at a lower level (so you can't see cars from the monument – it seems to be all cleverly thought out). Inside the museum the exhibition consists of different parts. It starts out with the build-up to the genocide, in the form of massacres of Armenians e.g. in Adana in 1909, as well as a documentation of the life of Armenians in what is today Turkey (Western Armenia). The main focus is naturally on the year 1915 – the one that the term Armenian genocide is mostly associated with and in which it peaked (even though it carried on into the post-World-War-One period too). The destruction of communities, massacres, deportations into the Syrian desert, eyewitness reports and diplomats' statements are all well documented. 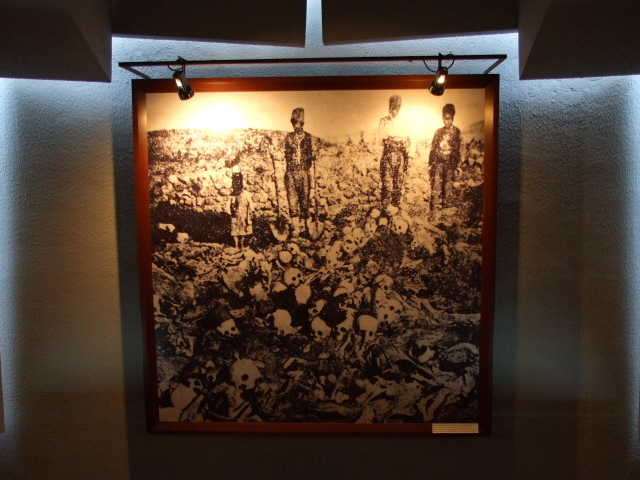 What hammers in the horrors of the genocide most, however, are the photos of the dead or of near starved deportees, including countless children, as well as of mass graves … which look nothing short of the killing fields of Cambodia or Rwanda. 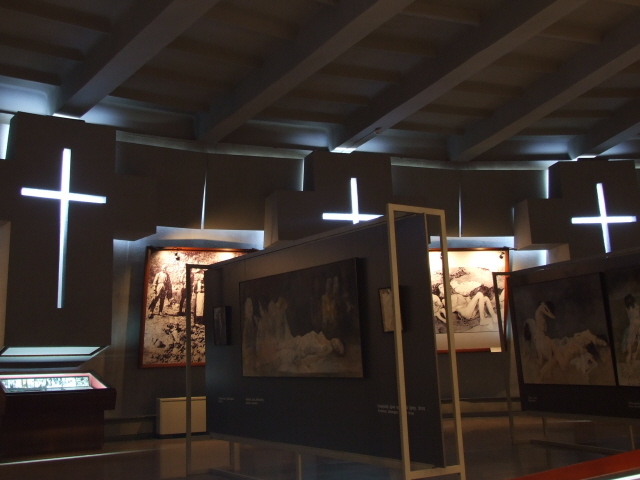 More visual horror is provided by a series of large-scale paintings that are placed in rows between the walls of the museum bearing the factual documentation. They are pretty drastic depictions of deportations and massacres. There are not many original artefacts on display, however, which isn't so unexpected, given how long ago these events took place – and where they took place. Amongst the few original objects are handcuffs used in the deportations or fragments of church buildings destroyed in formerly Armenian communities. The quasi-religious undercurrent of the main part of the exhibition is also present in the form of light coming in through narrow gaps in the wall shaped like Christian crosses … so their gloomy presence forms a constant backdrop. The ongoing "cultural genocide", e.g. 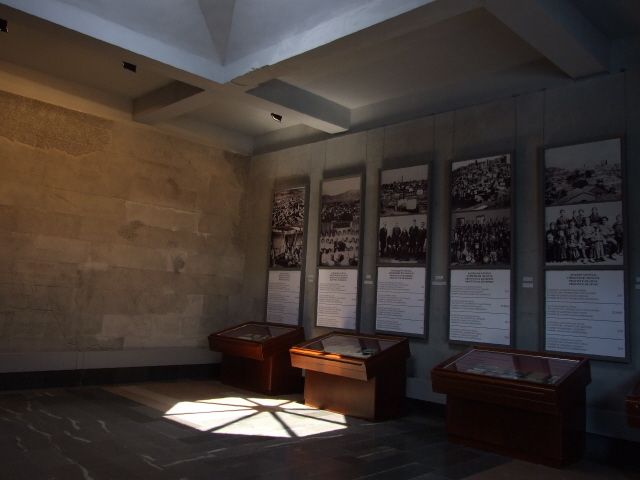 in the form of the destruction or at least lack of preservation of Armenian architecture within Turkey (or Azerbaijan), is also touched upon (see especially Ani), as is the international reaction to the topic of the fate of the Armenians then and today. A special temporary exhibition supplementing the main one at the time of my visit in August 2010 elaborated on the subject of commemoration and media coverage. Finally, there is a bookshop which stocks numerous, mostly scholarly volumes on the subject. In addition the institute has a library (Tuesday to Saturdays 10 a.m. to 4 p.m.) and also collections of documents for further in-depth study (see also www.genocide-museum.am). 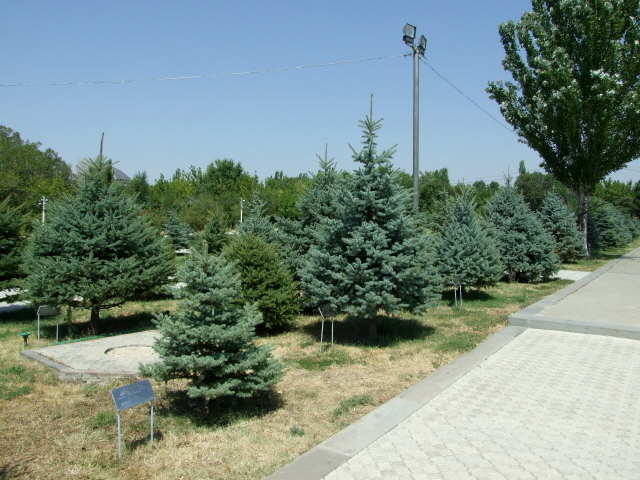 To honour those institutions and representatives of states or organizations who've made official statements in recognition of the Armenian genocide, there is a small arboretum just outside the museum, in an area just beyond the exit leading from the museum to the monuments outside. 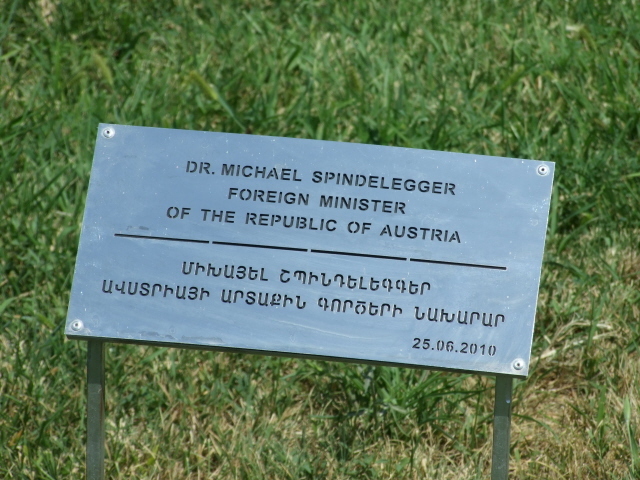 Here a memorial tree is planted for each of these representatives/organizations and a small metal plaque gives the relevant names in Armenian as well as the language of the country concerned. You can find trees/plaques e.g. for Russia's former president Medvedev, Poland's Lech Walesa, the European Commission's president Romano Prodi, various other organizations (including Red Cross branches), and I even spotted two plaques for Austria (the country I am currently resident in). 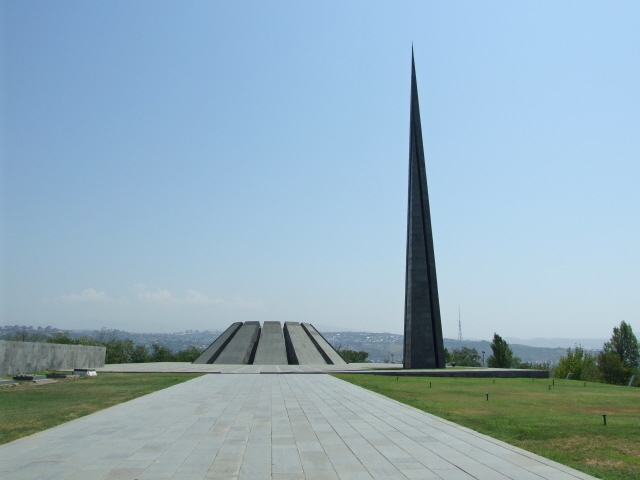 All in all, the Armenian genocide memorial museum and the monument at Tsitsernakaberd in Yerevan together form a very powerful site and possibly the most significant single place for the dark tourist to visit in the country – it is certainly the most developed one. The language coverage is also above the usual standards in the region, with Armenian labelling and texts (mostly) supplemented by multilingual translations, of generally high quality, namely into Russian, English and French. Location: On the top of Tsitsernakaberd hill, which lies to the west of the city centre of Yerevan, beyond the Hrazdan gorge and stadium. Access and costs: easy by taxi, or a slightly less easy walk up a hill; free. Details: to reach the memorial it's most convenient to just get a taxi – there is no public transport going there, and you may want to avoid having to walk it all the way to the hilltop location. 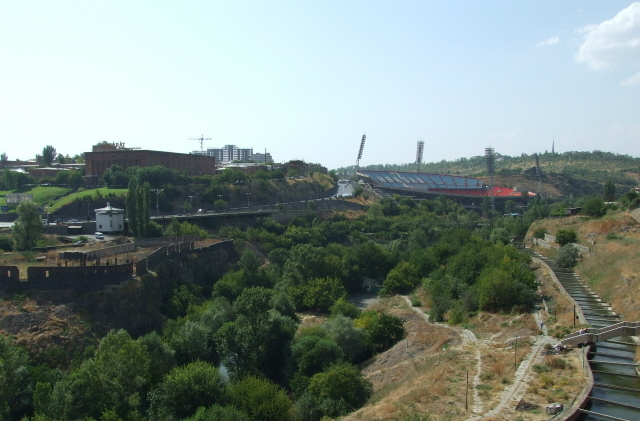 If you do feel up for it, however, then first cross Victory Bridge at the western end of the city centre, then walk north along the western side of the Hrazdan gorge past the Ararat brandy factory compound to your left, then head west again to get past the Hrazdan stadium on the right. You'll then come to a large bazaar-like market (clothing mainly) – and you can chose to either work your way through the labyrinthine giant shed of the indoors market to get to the opposite end, or walk around it along the road. You need the track going further up north from the bazaar. When you get to the park-like hill itself, you can either follow the more obvious path straight on (with square patterns in the pavement) and then up to the top along a wider, stepped approach branching off to the left, which takes you to the monument's eastern access – or take the shortcut going up diagonally straight to the monument from the south. From the city centre the walk takes between ca. 30 and 40 minutes. By car one has to go further round the back of the hill: from the roundabout by the bazaar/market take the Tsitsernakaberd road branching off to the north-west and going past more sports facilities/fields; just after the road takes a bend to the left, turn right and then left again after 150 yards or so; follow the road up the hill until you come to the (free) car park to the right, just in front of the museum. The monument would in theory be accessible at all times, but it makes little sense to go there and not visit the museum as well, so better time it right. Admission free (but donations are welcome). Time required: for the museum alone you should factor in an hour or so, possibly more if you want to study everything in the fullest detail. Extra time may have to be added for temporary exhibitions (depending a bit on their topic) and/or the bookshop. The monument outside deserves at least another 20-30 minutes. Yet more time can be spent at the arboretum. All in all you should allocate about 2 hours (plus time for getting there). 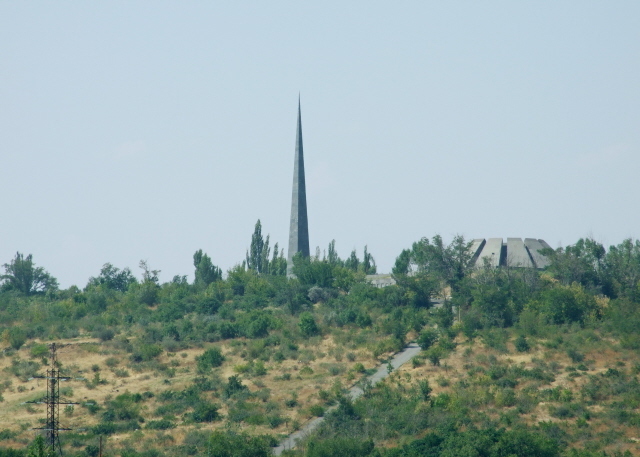 Combinations with other dark destinations: Yerevan's other main dark tourism attraction, the Mother Armenia statue & Military Museum, is located on another hill to the north-western side of the inner city core, a bit far for walking, but you could grab a cab for the journey – or at least part of it, e.g. to the bottom of the Cascade, from where it's an easy ascend (by escalator) and a short walk through the park. One of Yerevan's quirkier-rather-than-downright-dark sites is located just across the Hrazdan river gorge: the Sergei Paradjanov house museum. The Kond neighbourhood is a just a stone's throw away to the north of this museum. 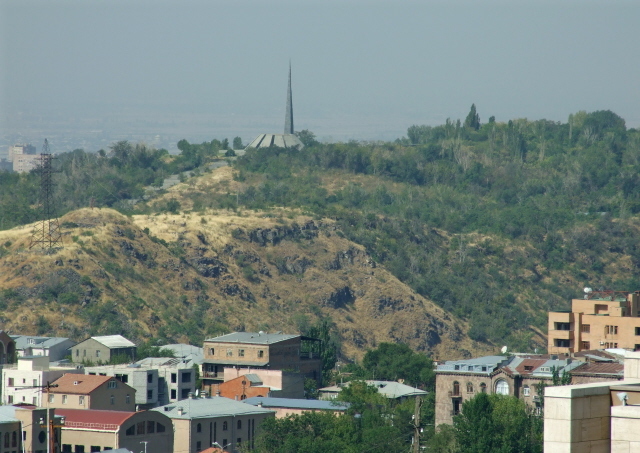 And at the bottom of Tsitsernakaberd hill itself is the Ararat brandy company, which has a little dark element to it too – for more info on all of these see under Yerevan. Combinations with non-dark destinations: The monument and memorial museum are located on a landscaped hillside park, so you could also wander around in this park for a bit … though it's not that smashing a park once you get away from the monument complex. You do get some good views over the city and the Hrazdan gorge from higher up, though. The next really worthwhile tourist attraction is at the bottom of the hill: the Ararat Yerevan brandy factory, home of Armenia's most celebrated spirit, and the guided tours and tastings there are amongst Yerevan's prime tourist offerings.